Available models for predicting lymph node invasion (LNI) in prostate cancer (PCa) patients undergoing radical prostatectomy (RP) might not be applicable to men diagnosed via magnetic resonance imaging (MRI)-targeted biopsies. To assess the accuracy of available tools to predict LNI and to develop a novel model for men diagnosed via MRI-targeted biopsies. A total of 497 patients diagnosed via MRI-targeted biopsies and treated with RP and extended pelvic lymph node dissection (ePLND) at five institutions were retrospectively identified. Three available models predicting LNI were evaluated using the area under the receiver operating characteristic curve (AUC), calibration plots, and decision curve analyses. A nomogram predicting LNI was developed and internally validated. Overall, 62 patients (12.5%) had LNI. The median number of nodes removed was 15. The AUC for the Briganti 2012, Briganti 2017, and MSKCC nomograms was 82%, 82%, and 81%, respectively, and their calibration characteristics were suboptimal. A model including PSA, clinical stage and maximum diameter of the index lesion on multiparametric MRI (mpMRI), grade group on targeted biopsy, and the presence of clinically significant PCa on concomitant systematic biopsy had an AUC of 86% and represented the basis for a coefficient-based nomogram. This tool exhibited a higher AUC and higher net benefit compared to available models developed using standard biopsies. Using a cutoff of 7%, 244 ePLNDs (57%) would be spared and a lower number of LNIs would be missed compared to available nomograms (1.6% vs 4.6% vs 4.5% vs 4.2% for the new nomogram vs Briganti 2012 vs Briganti 2017 vs MSKCC). Available models predicting LNI are characterized by suboptimal accuracy and clinical net benefit for patients diagnosed via MRI-targeted biopsies. A novel nomogram including mpMRI and MRI-targeted biopsy data should be used to identify candidates for ePLND in this setting. We developed the first nomogram to predict lymph node invasion (LNI) in prostate cancer patients diagnosed via magnetic resonance imaging-targeted biopsy undergoing radical prostatectomy. Adoption of this model to identify candidates for extended pelvic lymph node dissection could avoid up to 60% of these procedures at the cost of missing only 1.6% patients with LNI. Google ScholarSee all References, 6xMemorial Sloan Kettering Cancer Center. Dynamic prostate cancer nomogram: coefficients. www.mskcc.org/nomograms/prostate/pre-op/coefficients. Google ScholarSee all References, 8xBandini M, Marchioni M, Preisser F, et al. A head-to-head comparison of four prognostic models for prediction of lymph node invasion in African American and Caucasian individuals. Eur Urol Focus. In press. https://doi.org/10.1016/j.euf.2017.11.013. Google ScholarSee all References]. However, they are all based on standard systematic biopsies. Recent changes in the diagnostic pathway for clinically localized PCa with the introduction of multiparametric magnetic resonance imaging (mpMRI) and MRI-targeted biopsy might preclude their applicability to contemporary patients for three different reasons. (1) These tools were developed using historical cohorts of men undergoing systematic biopsy and the results might not be generalizable to men diagnosed via MRI-targeted biopsy [9xDell’Oglio P, Stabile A, Dias BH, et al. Impact of multiparametric MRI and MRI-targeted biopsy on pre-therapeutic risk assessment in prostate cancer patients candidate for radical prostatectomy. World J Urol. In press. https://doi.org/10.1007/s00345-018-2360-1. Google ScholarSee all References, 14xvan den Bergh R, Gandaglia G, Tilki D, et al. Trends in radical prostatectomy risk group distribution in a European multicenter analysis of 28 572 patients: towards tailored treatment. Eur Urol Focus. In press. https://doi.org/10.1016/j.euf.2017.07.003. Google Scholar See all References ]. Google Scholar See all References ]. Patients with a PI-RADS score ≥3 lesion on mpMRI were considered for prostate biopsies. Lesions with a PI-RADS score ≥3 on mpMRI were submitted to targeted biopsy. MRI-targeted biopsies were performed by experienced urologists using real-time transrectal ultrasound (TRUS) guidance via a software registration system. A minimum of two targeted cores were taken for each suspicious lesion on mpMRI. All patients also underwent concomitant systematic biopsy at the time of the targeted biopsy, with at least six random cores taken outside the MRI-targeted biopsy area. The number of targeted and systematic cores varied according to the judgment of each treating physician. Google Scholar See all References ] was adopted. The outcome of interest in our study was LNI, defined as the presence of positive lymph nodes at final pathology. Google Scholar See all References ] and MSKCC [6x Memorial Sloan Kettering Cancer Center. Dynamic prostate cancer nomogram: coefficients. www.mskcc.org/nomograms/prostate/pre-op/coefficients. Google Scholar See all References ], and MSKCC [6x Memorial Sloan Kettering Cancer Center. Dynamic prostate cancer nomogram: coefficients. www.mskcc.org/nomograms/prostate/pre-op/coefficients. Google Scholar See all References ]. Finally, we investigated the clinical implications of using different cutoff points for the novel nomogram and the currently available tools. In particular, the sensitivity, specificity, number of LNI cases that would be missed, and number of ePLND procedures that would be avoided were calculated. All statistical tests were performed using R v.3.0.2 (R Project for Statistical Computing, www.r-project.org). All tests were two sided, with the significance level set at p < 0.05. Overall, 65 patients (12.5%) had LNI (Table 1Table 1). The median number of lymph nodes removed was 15 (interquartile range 11–20). Preoperative PSA, median maximum diameter of the index lesion on mpMRI, clinical stage on DRE and mpMRI, biopsy grade group overall and according to the type of biopsy (MRI-targeted vs systematic), and the percentage of positive cores overall and at concomitant systematic biopsy significantly differed between patients with pN0 and pN1 disease (all p < 0.001). PCa = prostate cancer; MRI = magnetic resonance imaging; RP = radical prostatectomy; IQR = interquartile range; PSA = prostate-specific antigen; PI-RADS = Prostate Imaging-Reporting and Data System; mpMRI = multiparametric MRI; csPCa = clinically significant PCa. aThe χ2 test and Mann-Whitney test were used to compare proportions and medians, respectively. Google ScholarSee all References], and 81% (95% CI 76–87%) for the MSKCC nomogram [6xMemorial Sloan Kettering Cancer Center. Dynamic prostate cancer nomogram: coefficients. www.mskcc.org/nomograms/prostate/pre-op/coefficients. Google ScholarSee all References] in our cohort of patients diagnosed via targeted biopsies. The Briganti 2012, Briganti 2017, and MSKCC nomograms exhibited suboptimal calibration characteristics in our cohort (Supplementary Fig. 1). On univariable analyses, preoperative PSA, clinical stage on DRE and mpMRI, maximum diameter of the index lesion on mpMRI, biopsy grade group on targeted biopsy, and the percentage of cores with clinically significant PCa on systematic biopsy were independent predictors of LNI (all p ≤ 0.04; Table 2Table 2). Conversely, the number of positive cores on targeted biopsy was not associated with the risk of LNI on final pathology (p = 0.7). When these covariates were fitted in multivariable models, the one including clinical stage on mpMRI and information on the presence of clinically significant PCa on systematic biopsy achieved the highest AUC on internal validation (86%) and a slightly higher clinical net benefit below the 10% threshold probability (Supplementary Fig. 2). Therefore, this model was used as the basis for the novel nomogram predicting LNI. Figure 1Figure 1 graphically depicts the multivariable effect of each variable on the risk of LNI in the form of a nomogram (coefficients are shown in Supplementary Table 1). Table 3Table 3 lists errors associated with the use of the novel nomogram when predicting a low risk of LNI. Using cutoffs of 5% and 7%, 217 (51%) and 244 (57%) ePLND procedures would be avoided and LNI would be missed in only four (1.8%) and four (1.5%) patients, respectively. DCA revealed that the novel nomogram improved clinical risk prediction against LNI threshold probabilities of ≤20% (Fig. 2Fig. 2). LNI = lymph node invasion; MRI = magnetic resonance imaging; OR = odds ratio; CI = confidence interval; PSA = prostate-specific antigen; DRE = digital rectal examination; mpMRI = multiparametric MRI; IL = index lesion; TBx = targeted biopsy; csPCa = clinically significant prostate cancer; SBx = systematic biopsy; AUC = area under the receiver operating characteristic curve. aBased on 428 patients with complete available data and 54 events. Novel nomogram predicting the probability of lymph node invasion (LNI) for patients diagnosed via targeted biopsies and treated with radical prostatectomy and extended pelvic lymph node dissection. mpMRI = multiparametric magnetic resonance imaging; PCa = prostate cancer; PSA = prostate-specific antigen. LNI = lymph node invasion; hLNI = histologically confirmed LNI; PLND = pelvic lymph node dissection. Google ScholarSee all References], and MSKCC [6xMemorial Sloan Kettering Cancer Center. Dynamic prostate cancer nomogram: coefficients. www.mskcc.org/nomograms/prostate/pre-op/coefficients. Google ScholarSee all References] nomograms). Google ScholarSee all References] and MSKCC [6xMemorial Sloan Kettering Cancer Center. Dynamic prostate cancer nomogram: coefficients. www.mskcc.org/nomograms/prostate/pre-op/coefficients. Google ScholarSee all References] models. Use of a 7% cutoff would avoid a slightly lower number of ePLNDs (57%) in comparison to the Briganti 2012 (66%), Briganti 2017 (60%), and MSKCC (62%) nomograms (Table 4Table 4). However, this would result in a substantially lower number of LNI cases missed in comparison to these models (1.6% vs 4.6% vs 4.5% vs 4.2% for the novel vs Briganti 2012 vs Briganti 2017 vs MSKCC nomogram, respectively). Briganti 2017 [14xvan den Bergh R, Gandaglia G, Tilki D, et al. Trends in radical prostatectomy risk group distribution in a European multicenter analysis of 28 572 patients: towards tailored treatment. Eur Urol Focus. In press. https://doi.org/10.1016/j.euf.2017.07.003. MSKCC [6xMemorial Sloan Kettering Cancer Center. Dynamic prostate cancer nomogram: coefficients. www.mskcc.org/nomograms/prostate/pre-op/coefficients. hLNI = histologically confirmed lymph node invasion; PLND = pelvic lymph node dissection. aData available for 428 patients. bData available for 496 patients. cData available for 479 patients. dData available for 497 patients. Google ScholarSee all References], they were developed using data for men diagnosed via systematic biopsy. Thus, they might not be applicable to contemporary patients undergoing mpMRI and targeted biopsy. The quantity and quality of information for preoperative risk stratification substantially differ between men diagnosed via MRI-targeted biopsy and those undergoing systematic biopsy alone [9xDell’Oglio P, Stabile A, Dias BH, et al. Impact of multiparametric MRI and MRI-targeted biopsy on pre-therapeutic risk assessment in prostate cancer patients candidate for radical prostatectomy. World J Urol. In press. https://doi.org/10.1007/s00345-018-2360-1. Google ScholarSee all References]. For example, none of the available nomograms predicting LNI account for the type of biopsy cores (targeted vs systematic) or include mpMRI information. Thus, there are no data to assist clinicians in identifying PCa patients diagnosed via MRI-targeted biopsy who should be considered for ePLND. 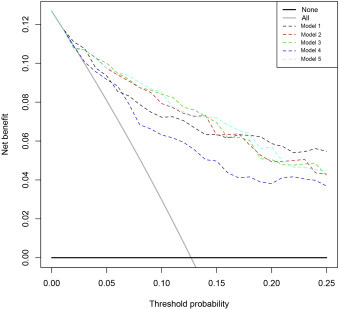 Given this paucity of data, we tested the performance characteristics of three models predicting LNI and developed a novel nomogram using data for a cohort of contemporary patients diagnosed via MRI-targeted biopsy. Google ScholarSee all References]. For example, a patient with three cores of grade group 2 PCa on targeted biopsy and negative random sampling would have the same risk of LNI as a man with three positive random cores in three different areas of the prostate. However, the real tumor volume would differ between the two patients, with a substantial impact on the risk of LNI and thus on the selection of ePLND candidates. We tried to overcome this issue by accounting for the different impact of the results for targeted and systematic cores. Moreover, the tumor volume of the index lesion in MRI-targeted biopsy was estimated using the maximum diameter on mpMRI. In addition, since information on the presence of clinically significant disease outside the index lesion improved the predictive accuracy of our nomogram, we included a variable to account for the presence of clinically significant PCa on concomitant systematic biopsy. Although previous studies demonstrated that adding systematic cores at the time of MRI-targeted biopsy improves the detection rate of clinically significant PCa [21xPloussard G, Borgmann H, Briganti A, et al. Positive pre-biopsy MRI: are systematic biopsies still useful in addition to targeted biopsies? World J Urol. In press. https://doi.org/10.1007/s00345-018-2399-z. Google ScholarSee all References]. Nonetheless, MRI-derived data should be considered together with MRI-targeted biopsy information to achieve the highest predictive accuracy in preoperative estimation of the risk of LNI. Google ScholarSee all References] nomograms are more suitable. Google ScholarSee all References]. Therefore, formal external validation is needed before implementation of this model in clinical practice. Moreover, the relatively small sample size and number of events might limit its generalizability. It should also be highlighted that our model was developed using data for patients treated at high-volume European institutions, where the majority of men are Caucasians. Thus, caution is needed when generalizing our results to other races. Second, our study is limited by its retrospective nature and thus potentially influenced by patient selection biases typical of all retrospective series. Third, the multi-institutional nature of our study might have introduced heterogeneity in mpMRI and biopsy protocols. However, all patients underwent MRI-targeted biopsy at tertiary referral centers included in this multi-institutional study, mpMRI scans were evaluated by high-volume dedicated radiologists, and MRI-targeted and systematic biopsies were performed by experienced physicians and evaluated by dedicated uropathologists. Finally, the extent of nodal dissection varied according to the treating institutions and physicians. Nonetheless, removal of the obturator, internal iliac, and external iliac lymph nodes represented the minimum requirement for defining ePLND and these stations were dissected free in all patients included in our study. Currently available models predicting LNI are characterized by suboptimal accuracy and clinical net benefit for patients diagnosed via MRI-targeted biopsies. A novel nomogram specifically focused on men undergoing mpMRI targeted and concomitant systematic biopsies should be used to identify patients at higher risk of LNI who should be considered for ePLND. Adoption of this model using a 7% cutoff would avoid approximately 60% of ePLND procedures at the cost of missing only 1.6% of LNI cases. Author contributions: Alberto Briganti had full access to all the data in the study and takes responsibility for the integrity of the data and the accuracy of the data analysis. Study concept and design: Gandaglia, Briganti. Acquisition of data: Robesti, Fossati, Stabile, Dell’Oglio, Zamboni, Rakauskas, Moschini, Beauval. Analysis and interpretation of data: Gandaglia, Briganti. Drafting of the manuscript: Gandaglia, Briganti. Critical revision of the manuscript for important intellectual content: Briganti, Montorsi, Ploussard, Valerio, Mattei, Fiori, De Cobelli, Porpiglia, Roumiguié, Malavaud. Statistical analysis: Gandaglia, Dell’Oglio, Briganti. Administrative, technical, or material support: None. Supervision: Briganti, Montorsi, Ploussard, Valerio, Mattei, Fiori, De Cobelli, Porpiglia, Roumiguié, Malavaud. Financial disclosures: Alberto Briganti certifies that all conflicts of interest, including specific financial interests and relationships and affiliations relevant to the subject matter or materials discussed in the manuscript (eg, employment/affiliation, grants or funding, consultancies, honoraria, stock ownership or options, expert testimony, royalties, or patents filed, received, or pending), are the following: None. Funding/Support and role of the sponsor: None. Memorial Sloan Kettering Cancer Center. Dynamic prostate cancer nomogram: coefficients. www.mskcc.org/nomograms/prostate/pre-op/coefficients. Bandini M, Marchioni M, Preisser F, et al. A head-to-head comparison of four prognostic models for prediction of lymph node invasion in African American and Caucasian individuals. Eur Urol Focus. In press. https://doi.org/10.1016/j.euf.2017.11.013. Dell’Oglio P, Stabile A, Dias BH, et al. Impact of multiparametric MRI and MRI-targeted biopsy on pre-therapeutic risk assessment in prostate cancer patients candidate for radical prostatectomy. World J Urol. In press. https://doi.org/10.1007/s00345-018-2360-1. van den Bergh R, Gandaglia G, Tilki D, et al. Trends in radical prostatectomy risk group distribution in a European multicenter analysis of 28 572 patients: towards tailored treatment. Eur Urol Focus. In press. https://doi.org/10.1016/j.euf.2017.07.003. Ploussard G, Borgmann H, Briganti A, et al. Positive pre-biopsy MRI: are systematic biopsies still useful in addition to targeted biopsies? World J Urol. In press. https://doi.org/10.1007/s00345-018-2399-z. EAU Edu Platform highlights the best curated content in prostate cancer varying from scientific publications, to practical tools and educational materials.